It looks so quiet here at this wide natural part of the river. But the silence here has interruptions. There is often intermittent popping of gunfire from the nearby rifle range and this makes the silent pauses in between more distinct, more remarkably still. It’s as though the landscape holds its breath. It seems if you spend enough time here, those sounds somehow become part of the wide space. The haphazard rhythm its own sort of meditation. Thanks so much. I’m happy you think so. This is rather contented silence. No pressure. I like that last critter. For a moment it looked as if the stalk was an eye in sharp focus. Nice shots. Hi Disperser, that’s a tiny snail:) Thank you. Just love this series. I am glad to see you back on the river. On the cape (or point) I believe. Thanks for the tour of the river. It is my home. Not the exact one; but any river. Thanks again for sharing. I understand what you mean about any river, Wally. The frog was very cooperative! Thanks, Chillbrook. Karen I admire immensely your vision; your ability to minimalise, to reduce a scene to its bare bones, its essence; to capture the spiritual as well as the physical qualities of your subject. I love how you worded this. Thank you! The frog is great, beautiful color. The frog was very cool about the whole photo-shoot thing…thank you! Whoa! As I was scrolling down the photos I was not expecting the close up of froggy’s face! Very cool! So there is a rifle range nearby? Is this a target range open to the public, or for police training? That could be interesting. Yes, the rifle range is primarily a military facility but I think there may be limited civilian access – I’m not sure. It is interesting because it’s nestled in a green-space full of wildlife. Often a strange juxtaposition of sounds! le reflet graphique surprenant et fabuleux. Bravo! Merci beaucoup, j’ai trouvé les refelctions vraiment intéressant. Je suis content que vous les aimez! The world is full of wonder! Thank you, Elena. That’s such a beautiful one of the frog. Gorgeous gold! 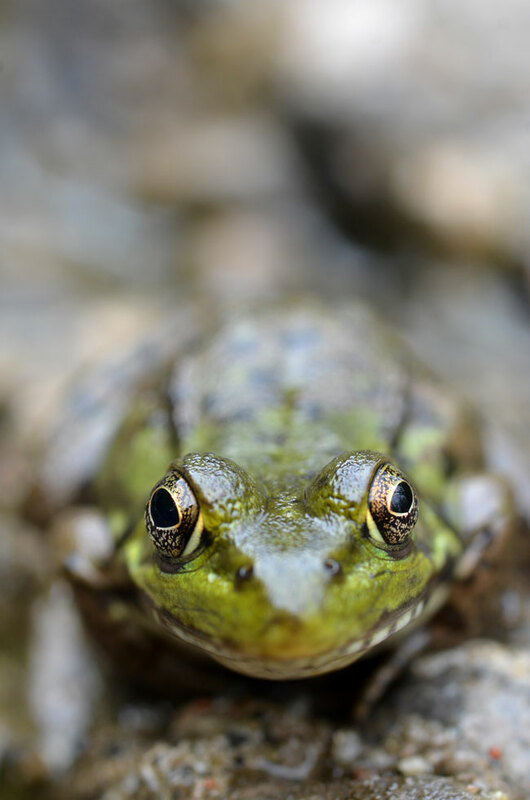 Frogs have the most incredible eyes, don’t they?! thanks very much, Trish! Really beautiful shots, Karen. 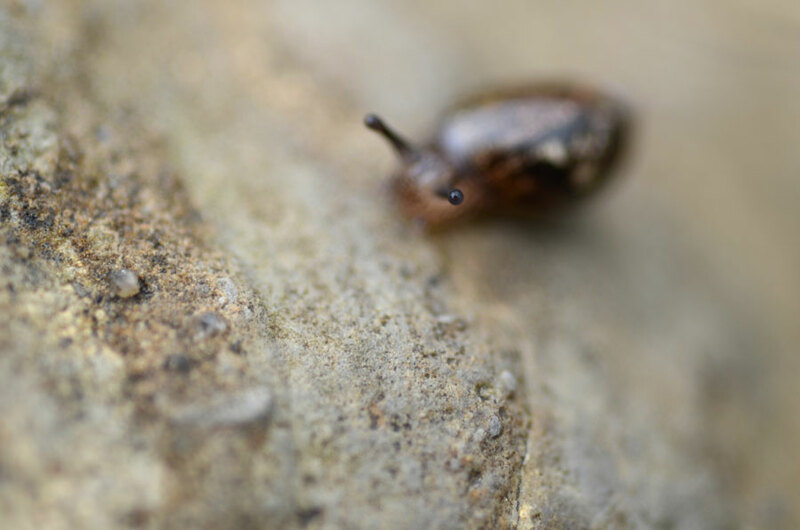 I love the very shallow DOF in the snail and frog shots. The second rippled reflection image really caught my eye, too. 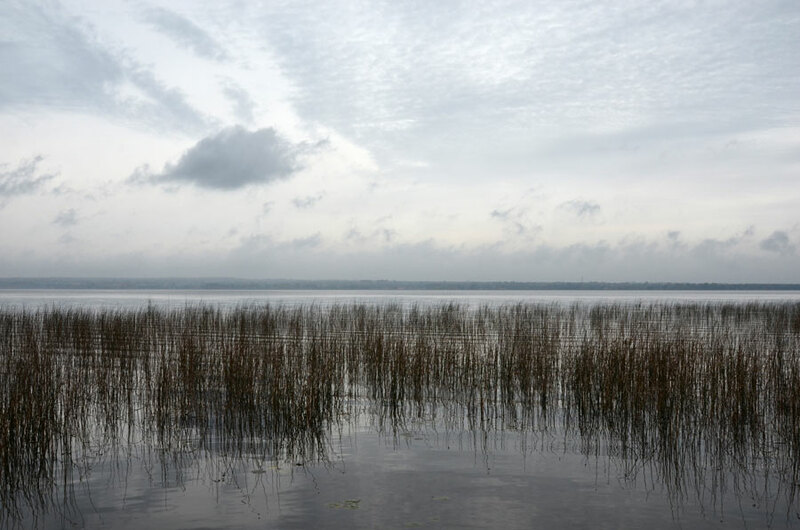 You’ve captured life in total stillness. Amazing! BTW I love that frog! Thank you Marina, the frog was very cool about it! Stunning post Karen. 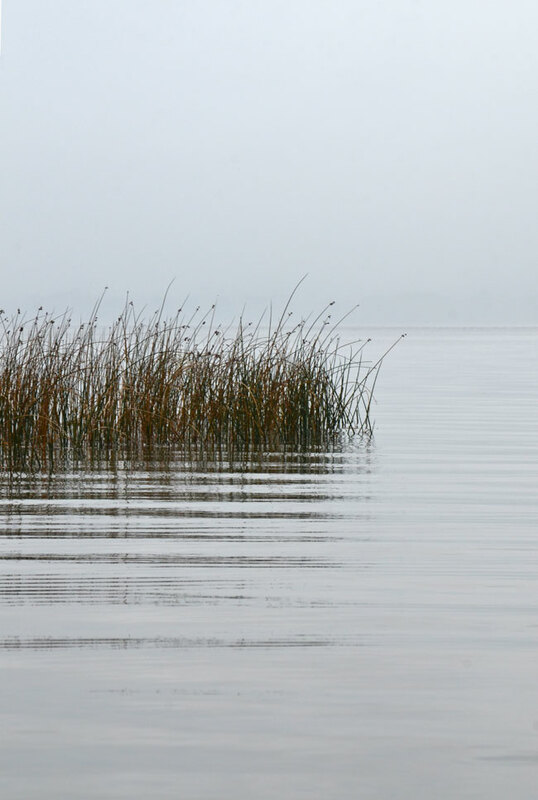 The photos just ooze tranquility. this is the sort of scene and quality of tranquility we seek on the Isle of Skye, going in two weeks, can’t wait! 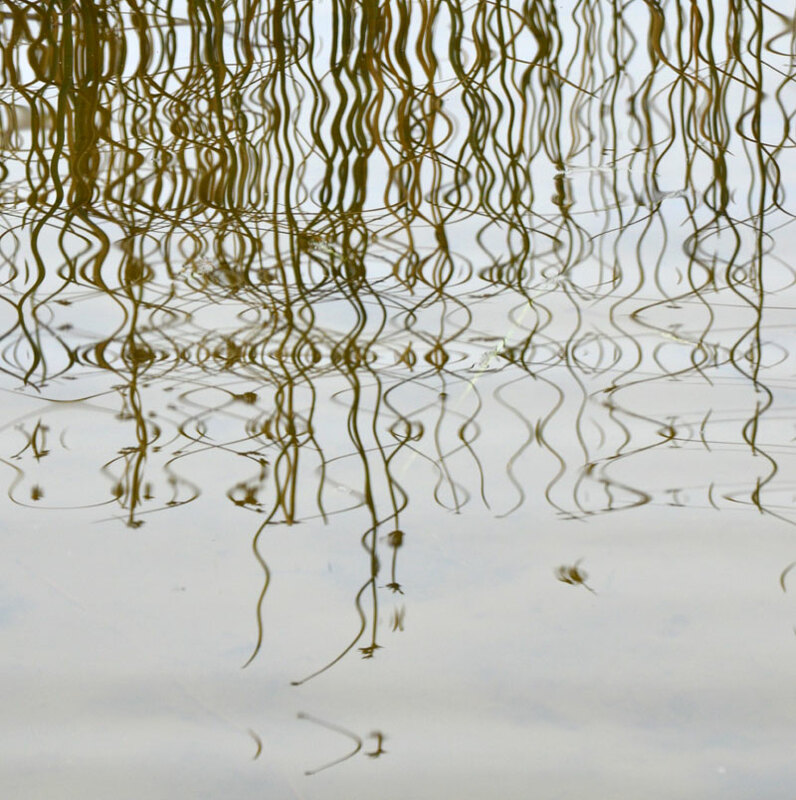 loved ‘Rippled reflections’. What a spot. Oh, do enjoy the Isle of Skye – it sounds idyllic! those abstract linear reflections – super! I appreciate the almost monochromatic palette of several of the images. 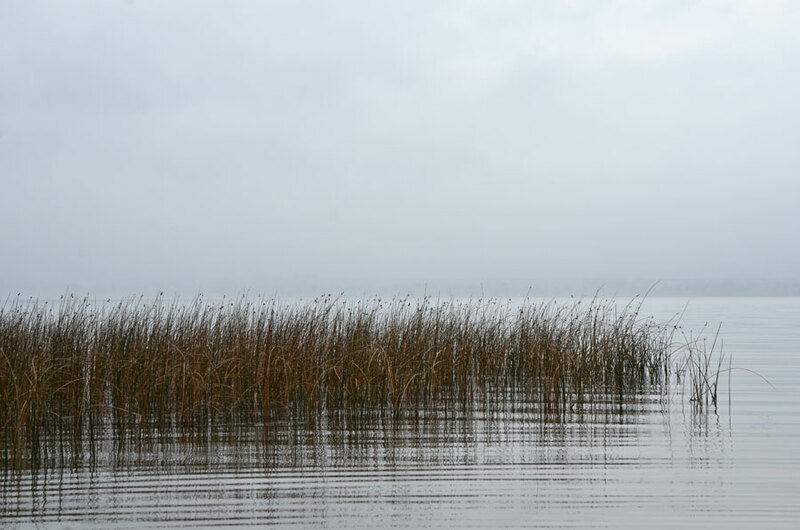 The first one reminds me of some of the scenes of marshes in 19th-century English photographs. It’s too bad (as I would experience it) that the sounds of gunfire impose themselves on the place, but the silver lining for you is the greater cherishing of the silences in between. Steve, thanks for you nice comments. The gunfire is unfortunate, it’s a vast green-space full of wildlife- It just sort of struck me how one can strangely adapt to these sorts of things. Such exquisite photography, visual serenity excluding the reality of sound. Thank you, yes – looks can be deceiving! I find rest in your photography… beautiful shots. A great comment, thank you very much – I’m glad you find them restful. Amazing! So calm and restful. I love the reflections, and that frog! We become attached to the familiar whether beneficial or not. The spirit I see in these photos is familiar and beneficial. Thank you, Lorne. I hope you are more than adequate! Yes, more than adequate and I’m amazed you remember that. I’m generally a lurker, but I have you in my RSS reader so I’ll be here even if you don’t hear from me. I’m forwarding you to my mom too. In 2012 everything is frantic ! Peace, tranquility and balance are essential today more than ever. Many thanks for sharing your corner of the world ! I think I’m always looking for those places of tranquility, and I’m happy to share them. Thank you, Chris. A moment of zen… lovely. 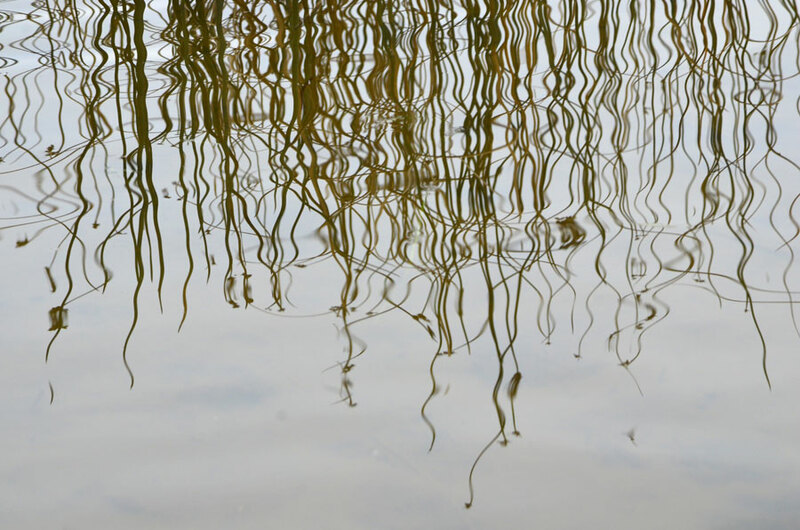 The curly grass reflections dance as I gaze upon them! That frog is just great ! lovely calming pictures. love the frog! Exquisite photography, Karen. Love the frog who’s joined you. Much thanks, Simon. I liked that frog, too! Such beauty, grace and tranquility captured in these beautiful photographs. Your work never ceases to amaze me. A very kind comment, shez, and much appreciated, thank you! Hi Gigi, yes, it’s a strange juxtaposition. Beautiful and unsettling at the same time. Thank you, Marina. That frog has great eyes, huh? The camera can only capture so much, it leaves some things unsaid… Thank you, Scott. La rana tiene unos ojos muy bonitos! Gracias. fantastic images and thoughtful writing. These are simply amazing. 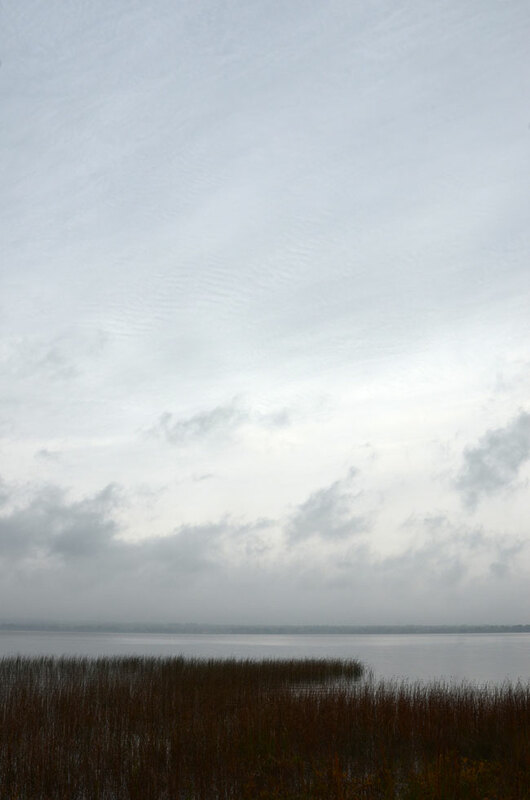 I love the silvery colors of the landscape shots, how they are almost monochromatic. The shot with snail. What a wonderful use of focus. Seriously amazing work. A casual noise makes silence exceptional. I adore how you catch the beautiful still breath of this landscape! What a delightful series! The frog and the reflecting flora are particularly special.